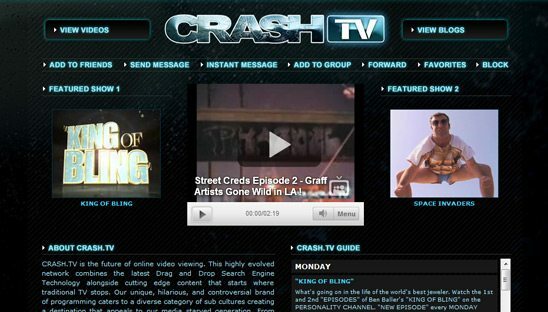 CRASH.TV is the future of online video viewing. This highly evolved network combines the latest Drag and Drop Search Engine Technology alongside cutting edge content that starts where traditional TV stops. Our unique, hilarious, and controversial brand of programming caters to a diverse category of sub cultures creating a destination that appeals to our media starved generation. From hard-hitting hip hop and beautiful girls, to hilarious comedy and the latest in sports, you will find that viewing the eight quality controlled channels of CRASH TV is the next level of entertainment. The website is no longer on the web so they use this myspace layout as there primary website. We designed the page to look hi tech and we structured it so users can see many of there videos and categories.